Graphic Designer, Suann Song of Washington DC, noticed a need for quality desk accessories made here in the United States. Her line of desktop products, Appointed, began as a Kickstarter campaign in March of this year. It's safe to say, the campaign was a quick success. 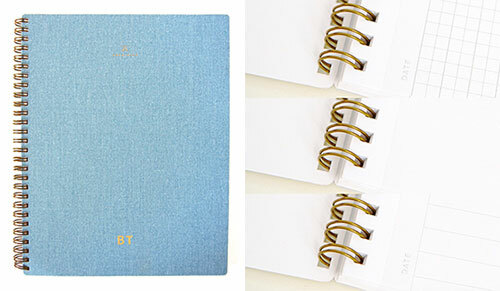 Suann's signature notebook is made with the highest quality materials, including a water resistant bookcloth cover, brass coil, recycled paper and preforated sheets that are either blank, lined or grid ruled. 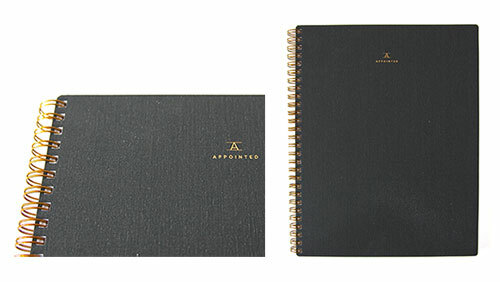 Plus, for a nice added touch, notebooks may be monogrammed as well. Suann has expanded her wares to include well made and refined desktop accessories like a minimalist brass mechanical pencil, a heavy weight brass pencil cup and ruler. Practical should be beautiful too. And I'm so happy to see Suann teamed up with my friend, Matt Weaver of Andover Trask, who created these natural waxed canvas pencil pouches with brass hardware. At 9" x 6.5", these pouches are large enough to hold Suann's workbook as well. Available in natural or charcoal. (small pouches available too) Classic perfection. Click here to see the entire Appointed collection.